Super Talent Technology has been making a name for itself in the Solid State Drive market with speedy SSDs and its PCIe based RAIDDrive solutions. The company is now announcing that it plans to be the first in the world to ship USB 3.0 flash drives, with first availability at the beginning of December. The SuperSpeed USB 3.0 interface supports transfer speeds up to ten times faster than regular USB 2.0. Although it has a theoretical throughput of 4.8 Gbps, USB 3.0 still uses 8b10 encoding. That overhead means that real world applications will top out at 400 MB/s, still much faster than the typical 35-40 MB/s with USB 2.0. “This product underscores Super Talent’s continued leadership in USB drives.” said Super Talent’s COO, Mr. C.H. Lee. “We’ve developed the world’s first mobile USB 3.0 flash drive. It delivers phenomenal performance and it incorporates our own patented technology”. 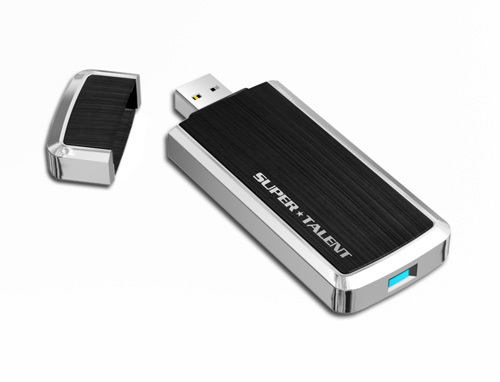 Super Talent’s new RAIDDrive USB 3.0 series uses patented “multiple pairs of differential serial data lines technology” for optimal NAND flash performance. It will transfer data at 200 MB/s using a USB 3.0 port, but it can reach up to 320MB/s using a UAS Protocol driver. The USB Attached SCSI (UAS) protocol runs over the USB 3.0 interface. The specifications were developed by the USB-IF to enhance the efficiency of USB storage devices. This is supposed to result in higher speeds and more consistent performance, as well as lower CPU utilization for both Hi-Speed USB 2.0 and SuperSpeed USB 3.0 devices. The new drive uses USB 3.0 hardware from NEC, and will be available in 32GB, 64GB and 128GB capacities. It will be fully backward compatible with all USB ports, but operates at much slower speeds. It measures a 95 x 37 x13 mm, and comes with a limited lifetime warranty. Super Talent states that the new drive will have more than 10 years of data retention. “SuperSpeed allows USB to meet the transfer demands of modern mass storage devices,” said Yoshiyuki Yamada, Senior Engineering Manager, Custom SOC Solutions Strategic Business Unit, at NEC Electronics America, Inc. The new drive comes at a good time, as the first motherboards supporting USB 3.0 have just hit the market. Pricing information is net yet available.